Home / Atlantis / BBC / Mythology / Reviews / [Review] - Atlantis, Series 1 Episode 8, "The Furies"
[Review] - Atlantis, Series 1 Episode 8, "The Furies"
You had your chance, Atlantis. You had your the means and opportunity to shrug off the last uneven weight of your program, and make the rest of the show and characters better for the loss. And instead, you went with... well, a lot of other stuff, in what ultimately turned out to be a Shaggy Dog story. And for what? To give your least defined character some backstory, three quarters of the way through your first year? And still failed to make him a sympathetic or likable, or important character? Bad form, Atlantis. Bad form. Hit the jump for the review, which contains spoilers that liked Pythagoras' brother more than they ever have Pythagoras, and the brother was a selfish twit. But first, to the myth! The Furies, or rather, the Erinyes as the Greeks knew them, were the balance keepers. While in the episode their domain is said to be limited solely to those that have been murdered, in the myths of Homer and Aeschylus, they heard all complaints, and exacted torment on those to blame. The mythical creature was a hodge-podge of elements; dogs heads, bat wings, old person smell, the whole lot. Additionally, the fable of Baucis and Philemon managed to work it's way into the episode, featuring the famously hospitable couple when they were just young lovers embarking on their lives of destitution. I was rather taken by the changes to the Furies. The show has done CGI beasties before, and considering how many Greek creatures were essentially women with wings (Erinyes, Sirens, Harpies, Keres, etc. ), it was a smart move for them to mix up the formula a touch. And while anthropomorphic dust squall might be considered by some to be an overdone cliche, I think it fit in with the desert theme rather nicely. And played at the angle of myths being inspired by naturally occurring events, like small dust squalls one might encounter in the desert. Problem is, and I'm going to keep revisiting this particular complaint: GREECE DOESN'T HAVE DESERTS! I don't know at what pitch meeting it was decided that Atlantis would be set in the middle of the Libyan desert, but so long as they keep using real ancient world locations as Atlantis' various neighbours, it's not going to be possible to take the Moroccan locations seriously. Greece has islands - lots of those - and rocks, hills, and some of the more Wales compatible locations like light forests. But not endless stretches of sand and heat. There are arid regions, certainly, but nothing that suggests Saharan conditions. Not north of the Mediterranean. An off hand comment by Hercules, referring to Greeks in the foreign sense was just odd, suggesting that I do need to reevaluate my theory. Maybe Atlantis is actually a Libyan city, thus explaining the copious deserts and the general absence of ships on the show, something that you'd think would be a feature of a show set in the Aegean. The episode, written by Julian Jones, has two storylines competing for attention, and unfortunately neither gets the better the either. It's all the more unfortunate because one of these was actually interesting, or at least was potentially thus. Story one is the arrival of Pythagoras' brother, Arcas, who has as little personality as his big brother. This family appears to be made up of just one focus at a time; Pythagoras is all about the being needless mean, and Arcas is obsessed with the-father-he-never-knew's death. These are character aspects, these are just one idea, extrapolated up and said to be a fully formed character, so long as no one pays too much attention. Problem is, this episode's express purpose (well, one of them) was to pay too much attention to them. So, it's little wonder that they hold together as a wicker band stand (which is to say, not at all). But at least this episode explains why Pythagoras always seems so cold, sardonic and mean spirited. The second story, the one that could have really been something, was the caravan crossing the desert. It's a shame that Arcas was there to literally summon the Furies, because the suggestion of the Furies I think would have been much more effective. The mysterious woman, the increasing dust squalls, the increasing paranoia amongst a group of strangers as the heat bares down. It could have been an increasingly tense and psychological thriller of an episode. Instead, they spent thirteen minutes alternatively yelling at Pythagoras not to kill himself (a waste of breath, if you ask me) or trying to convince Arcas to "forgive him in your heart," which sounds like a lyric from a mid-nighties Disney musical. A few weeks ago I congratulated a writer for recognising that a bunch of little ideas wouldn't be able to hold up their own episode. The opposite is true here. 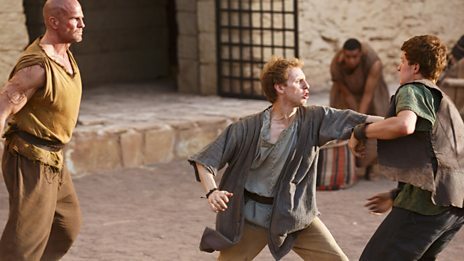 With the right hook, the crossing the (inexplicable) desert could have held it's own, leaving the Pythagoras storyline to never be told because it's too little too late for that character. As it stands, it's a very disjointed episode, which shows the shades of what the show has become the last couple episodes, and what the show has been since the beginning. There is much bloat (for instance, while playing off a tale of Ovid's, the Baucis and Philemon sub-plot adds nothing to the episode itself except for a distraction), which sits alongside some potentially cleaver stuff. Jack Donnelly is much improved as Jason, and his scenes with Mark Addy don't seem as one sided any more. In the end though, it's little more then a forgettable episode that had to be gotten through from Song of the Sirens on the way to next week's moody looking Pandora's Box.